How do I connect to the wireless network on campus? BOWDOIN - Use this network if you are a current student, faculty or staff member at Bowdoin. This network provides access to ALL Bowdoin services. 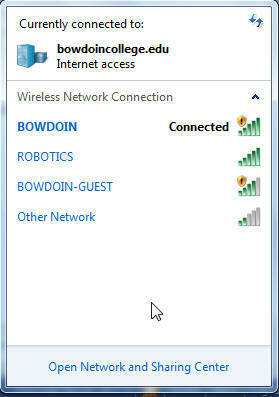 BOWDOIN-GUEST - Use this network if you are a guest of the College but do not have a Bowdoin username. You will need to enter your name and email address. Services such as printing and access to some network files are not availalble on this wireless network. 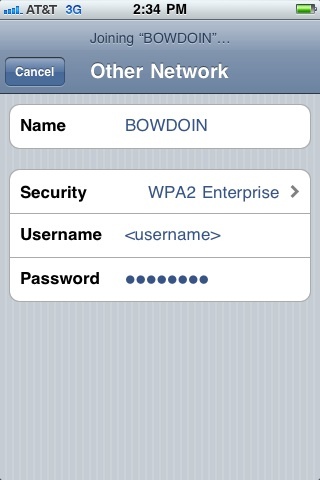 BOWDOIN-LEGACY - Use this network if your device does not support WPA2 Enterprise authentication (i.e., Wii, Xbox, Amazon Kindle (except Kindle Fire & newer), Sony eReaders, Android devices Running Android OS 3 and below, AppleTV, Playstation, etc.). To use this network you may request access by using the form located in the Service Catalog. If you need additional assistance, please contact Student Technical Services (x5050) or email sts@bowdoin.edu. 1. Click on the Airport icon by the system clock on the Macintosh desktop. 2. 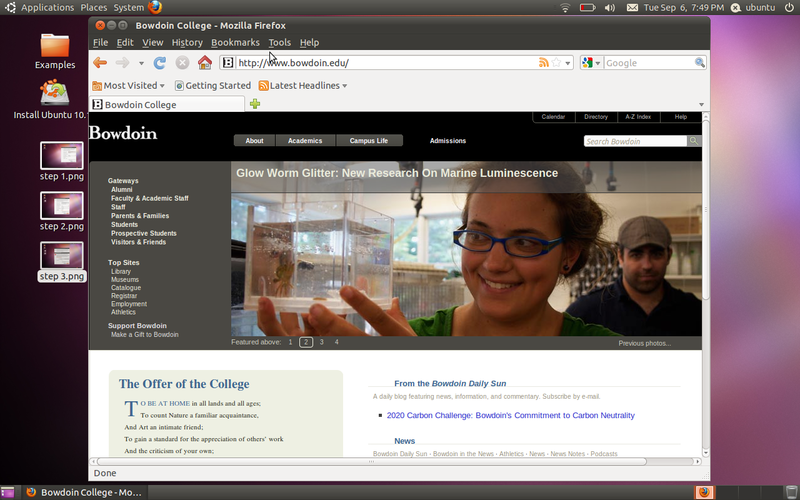 Choose BOWDOIN and enter your username and password. 3. 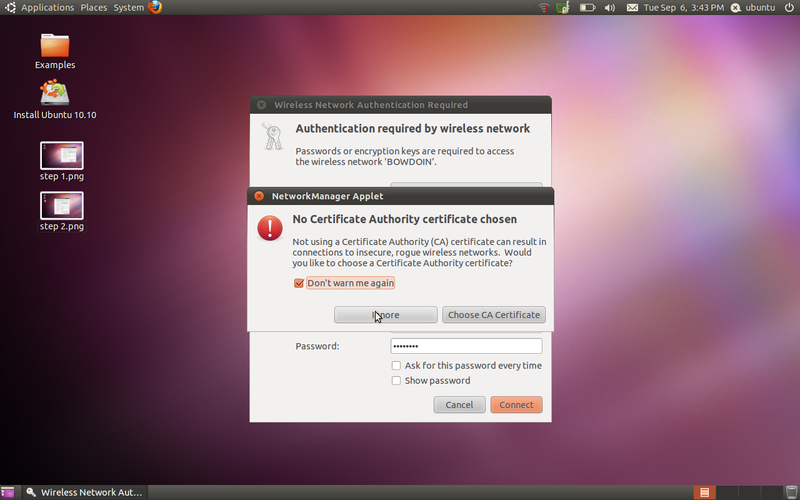 A Verify Certificate window will open the first time you connect. Click Continue to accept the certificate. It may take up to 30 seconds to get an ip address. 1. Make sure Windows is managing your wireless connections. 2. Click on the Wireless Icon in the taskbar located near the system clock. 3. 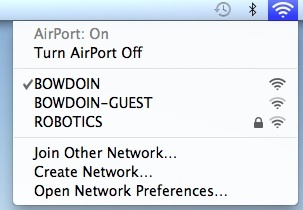 Choose BOWDOIN from the list of available wireless networks. 5. Accept the certificate if prompted. 3. Then in the window that comes up click "Connect". 5. 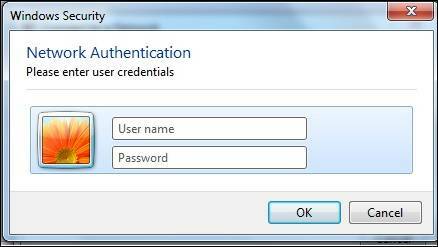 Choose "PEAP" for the 'EAP method', 'Phase 2 Auth' = automatic, 'Server CA certificate' = "Do Not Check"
6. Then enter your Bowdoin username in the 'Identity' field and then your Bowdoin password in the 'Password' field. Leave the 'Anonymous identity' field empty. 7. Click "Connect" and wait a moment and you should get a window that says "connected". password = your bowdoin password. 5. For the above window, check the box for "Don't warn me again" and click "Ignore"
6. You should then get a window that pops up and says "connected"
1. Select the Settings icon. 2. 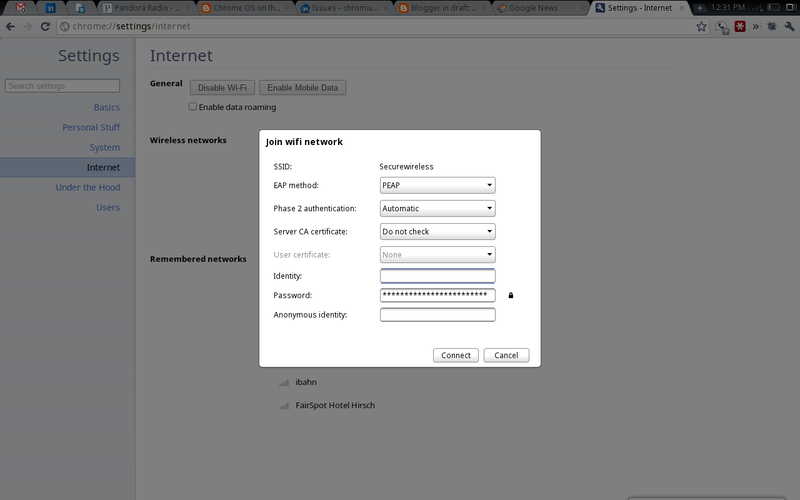 Select Wi-Fi and make sure Wi-Fi is turned on. 3. 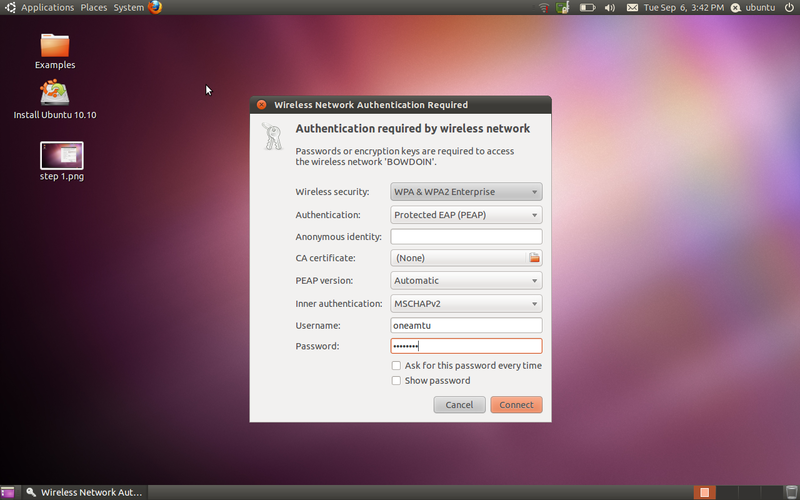 Under Choose Network... choose the wireless network. 4. Enter your Bowdoin Username and Password and tap Join. 5. 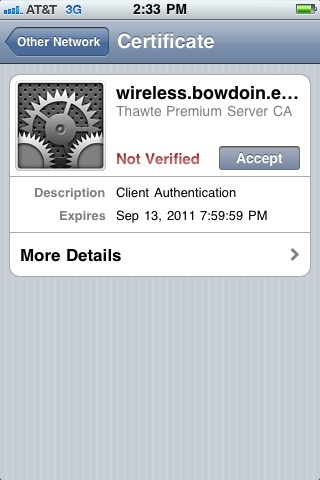 When asked, tap the Accept the security certificate.